Do you want to try out the ultimate shot-tracking device, engineered to help improve your handicap 46.7x faster than the average golfer? You can now experience the incredible Arccos 360 for FREE. Arccos is now offering customers an opportunity to try Arccos 360 FREE for 33 days as part of a limited and exclusive trial. After which you’ll be charged a £75 annual subscription to continue having full access to all the Arccos features. 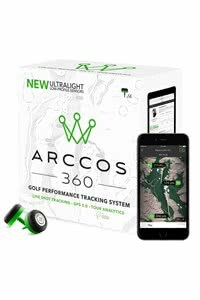 Help uncover the positives and negatives of your golf game with the incredible Arccos 360. Billed as the “Caddie in your pocket” this amazing golf performance tracking system has been specifically designed to capture your on-course data. Giving you swing-by-swing analysis that you can then use to make smarter decisions and lower your scores. "Please note: FREE Trial offer is only valid for Mainland United Kingdom customers." There are absolutely no hidden costs to this offer. Simply pay £9.99 to cover the postage costs when you redeem your free trial and after your 33 days ends Arccos will automatically start your £75 annual subscription, unless you choose to cancel your trial before then. Promotion valid for Mainland UK customers only. Trial will begin the day you redeem your free trial offer. Customer pays £9.99 to cover postage costs. £75 annual subscription starts automatically after 33 days of free trial period. Customer can cancel free trial by contacting at proshop@arccosgolf.com within 33 days of trial start date. For more details and full terms & conditions, please visit here.